Unique design allows for better cooking. 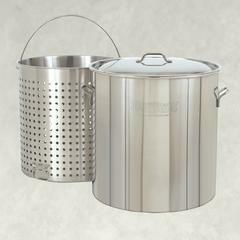 Heavy Duty Aluminum Boiling Pot with Basket and Lid. Made of thick aluminum that will last. These pots are made with a ring pressed into the side that supports the basket slightly off the bottom allowing for water flow and avoiding an overcooked hot spot from using a Jet burner. Ergonomic handles that will not smash your knuckles when lifting. Available in sizes 42qt, 60qt, 80qt, 100qt. For boiling a sack of crawfish you will want the 80qt or 100qt. The 100qt holds an average sack of crawfish as well as your sides. Replacement Basket or Lid available. You will have this pot so long as you don’t loan it to someone. You can find cheaper pots, but you cannot find these quality pots for less than we sell them.